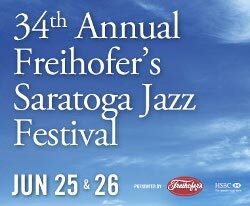 The 2011 Freihofer’s Saratoga Jazz Festival takes place Saturday and Sunday, June 25 and 26, in Saratoga Springs, NY. In this interview, festival producer and artistic director Danny Melnick takes us on a tour through the festival’s two days of music. Melnick also tells stories from his years producing festivals with Newport Jazz Festival founder George Wein. Learn more at www.spac.org/jazzfest/. Tracks used in this episode: We’ve Only Just Begun (Ben Allison, from Action-Refraction); All Of Time (David Binney, from Graylen Epicenter); Good Morning Heartache (Dee Dee Bridgewater, from Eleanora Fagan (1915-1959): To Billie With Love From Dee Dee); Blue Boy (George Wein, from George Wein’s Newport All-Stars); Third Occasion (David Binney; from Third Occasion) Jackie-ing (Ben Allison, from Action-Refraction). Several of the musicians appearing at the festival have been on The Jazz Session. Click on a link below to listen to an interview.